Welcome to our Texas State Facts section, part of an educational project designed to provide information about indigenous people in different U.S. states. 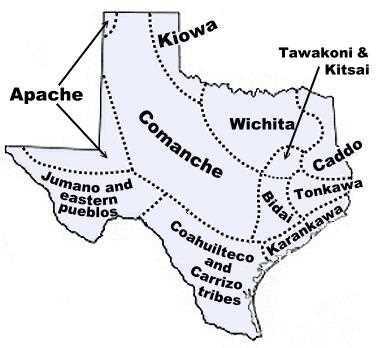 Follow the links to the right of our tribal map for more information about the language, culture and history of each Texas tribe, or scroll below the map for Texas Indian activities including a wordsearch, fact sheets, and words from the Native American languages of Texas. Feel free to print any of these materials out for classroom use! Did you know the name "Texas" comes from a Caddoan Indian word? It is a Spanish corruption of the Caddo word Taysha, which means "friend." The Caddo were not the only native people of this region, however. There are three federally recognized Indian tribes in Texas today. Texas Indian Word Search: Printable puzzle hiding the names of Texas' Indian tribes. Texas Language Greetings: Learn to say "hello" in several Native Texas languages. Texas Native Animals: Learn the Native American names of Texas animals. Texas Indian Facts for Kids: Answers to frequently asked questions about the Indian tribes of Texas. We currently have pages for the Apache, Caddo, Comanche, Kiowa, Cherokee, Coushatta, Kickapoo, and Wichita tribes. Texas Native Peoples: Good book introducing Texas' Native American history and culture to kids. Learn About Texas Indians: Another good book on Texas tribes for kids. The Texas Indians: A more in-depth look at Texas Native Americans, well-written and informative. Historic Native Peoples of Texas: Good anthropology book about Native American history in the different regions of Texas. The Indians of Texas from Prehistoric to Modern Times: History book about American Indians in Texas. Encyclopedia of Texas Indians: Thorough reference book about the Native American tribes of Texas. The Rock Art of Texas Indians: Art book of prehistoric Texas Indian petroglyphs. When The Storm God Rides: Collection of Native Texas legends. The Last Comanche Chief: Biography of Texas Indian leader Quanah Parker. Cynthia Ann Parker: Biography of his mother, a Texas colonist captured and adopted by the Comanches. Nonprofit organization working on behalf of the Coahuiltecan Indians of Texas. Articles aimed at kids about the native tribes of Texas. Historical profiles of the American Indian tribes native to Texas. An online lesson plan for teaching kids about Texas Indians. 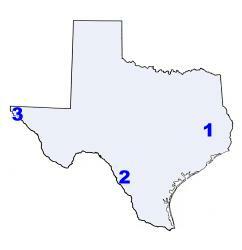 Would you like to sponsor our nonprofit work on Texas languages?